I had print my floor plan before which can show on an A4 paper as full size (fit to paper). But then I hv created another plan and try to print it, it always appear on the left on the A4 paper, and cannot be printed in full size. I tried the printing setting, but it didnt work. How can I print my plan fit to the paper? I want to hv a bigger view of the plan then leaving half of the paper blank. Thanks! Then we’ll take a look. here is the link, thanks! My problem still exists in which I couldn’t print the floor in full scale but only half the paper. Could you pls help? Thanks! Hi Mav, your plan had some objects in it. That’s why the zoom all functionality (and the print) didn’t work properly. I removed the items and now everything seems to work fine. 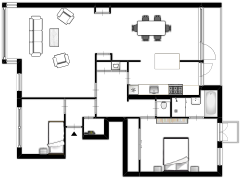 yea i have the same problem too, only my floorplan appears on the right side of the paper, how i can fix this..?